How were the canyons in the Copper Canyon region formed? According to a local Tarahumara Indian legend, the canyons were formed when “a giant walked around and the ground cracked.” However, geologists believe that a sequence of volcanic rocks varying in age from 30 to 135 million years was slowly uplifted to an average elevation of 2275 m (7500 ft) while being dissected by rivers. The Sierra Tarahumara is part of the Western Sierra Madre, an extensive volcanic tableland, affected by grabens (rift‑valley faulting) and faults which deprive it, especially on its flanks, of any homogeneous appearance. Its eastern side merges gradually into the Chihuahua basin and range landscape; its western side is much steeper, marked by major normal faults of considerable vertical extent, and by deep canyons. Stage 1. The lower rocks. McDowell and Clabaugh (1979) describe two different igneous sequences, which were separated in time by a prolonged period of non‑activity. The older series is mainly comprised of intermediate igneous rocks between 100 and 45 million years old; it shows evidence of lava flows and violent eruptive activity which produced andesitic pyroclasts. There are also layers of siliceous ignimbrites. This lower series includes many rich mineral deposits, though it outcrops in only restricted parts of the Canyon system. The volcanic activity in this area was associated with the subduction of the small (now destroyed) Farallon Plate which was pushed beneath the North American Plate by the expanding Pacific Plate. The line between the lower, older series and the higher, newer one is very irregular, indicating intensive erosional activity in the period between their times of formation. Stage 2. A break in activity allowing erosion to take place. The major lull in volcanic action, between 45 and 34 million years ago, may have been due to a change in the inclination of the subducting Farallon plate. Stage 3. The upper rocks. After this break in activity, there was a sudden resumption of vulcanism. The upper series is the most extensive cover of ignimbrite known anywhere in the world, covering an area which is 250 km wide, and 1200 km long from NW to SE. It stretches as far north as the southern USA. To the south, it disappears beneath the newer volcanic rocks of Mexico’s Volcanic Axis in Jalisco and Michoacán. The ignimbrites are rhyolitic and rhyo‑dacitic in composition, generally approximately horizontal, or slightly tilted, and with ages between 34 and 27 million years. In places, these ignimbrites are more than 1000 m thick (Demant & Robin, 1965). It is unclear precisely where all these volcanic rocks originated. One estimate is that for such large volumes of rock to have been formed, there would have been between 200 and 400 volcanic outlets, some up to 40 km across. An alternative hypothesis (proposed by Aguirre-Díaz & Labarthe-Hernández) is that large bodies of magma (molten rock underground) reached shallow parts of the crust and then partially erupted, explosively, along the fault lines of the existing basin and range structures. Volcanic Ash is unconsolidated fragments <2 mm in diameter. Volcanic ash commonly contains larger (up to 64 mm) fragments called lapilli. Ash may be composed of crystalline rock (eg. rhyolitic and andesitic ashes), of glassy fragments (vitric ash), or of individual crystals (crystal ash). In general, the size of individual particles comprising the ash diminishes as distance increases from the volcano where it originated. Tuff is consolidated volcanic ash. Ignimbrites are essentially pieces of light, vesicular, pumice, in a matrix of glassy fragments. Ignimbrites are often layered and sometimes split into vertical columns. They are deposited from ash flows that included large volumes of hot, expanding gases and incandescent glass fragments. Lavas (molten rock on the surface). When lava cools and solidifies, it produces massive (as opposed to fragmentary) rocks, generally crystalline but of variable chemical composition (andesite, rhyolite, basalt). These layers of igneous rocks were uplifted, forming a plateau with an average elevation of 2275 m (almost 7500 feet). Rivers have carved deep gashes, up to 1400 m deep, into the plateau surface, forming a series of steep-walled canyons, separated by giant blocks, remnants of the original, continuous plateau. Since some of the rivers exhibit superb examples of incised meanders [see photo], some, possibly most, of these rivers already existed prior to the main periods of uplift. They were meandering across a gently sloping flood plain prior to the tectonic upheavals. Then, as the landscape slowly rose around them, they carved these giant canyons. These antecedent rivers retained their courses; the meanders were incised into the landscape. Centuries of erosion by the various rivers, including the Urique river and its tributaries, have resulted in the present-day landscape of structurally-guided plateau remnants, termed mesas, buttes and pinnacles (depending on their size). 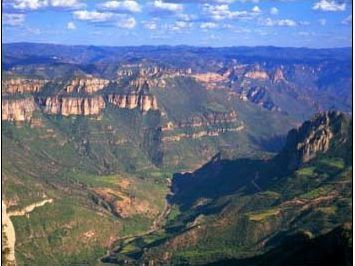 There are many examples of these distinctive landforms in the Copper Canyon region. It is likely that some of the many waterfalls in the region were formed in places where the downward vertical erosion of rivers was insufficiently powerful to counteract the forces of uplift. Other waterfalls are more likely to have resulted from differences in the relative resistance of different rocks. The effects of differential erosion are noticeable in many smaller-scale features in this landscape, such as perched “mushroom” rocks. Examples of many of these landforms can be seen by anyone driving along the Creel-Batopilas road. 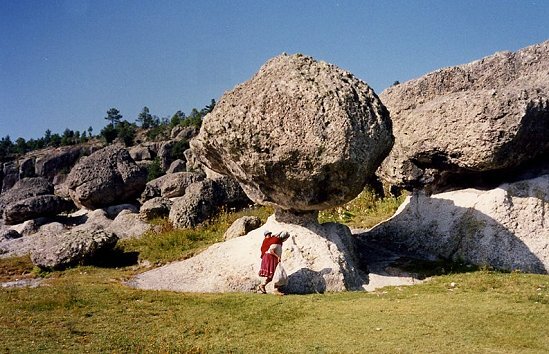 At km 5 (from Creel) is the entrance to the Mission village of San Ignacio, near which are strange tor‑like rock formations, including “mushroom” rocks, where a more resistant capstone sits perched atop weaker rocks that are slowly being eroded away. At km 20 in Cusárare, a short walk south of the road through woods and along the Cusárare river leads to the very pretty 30-metre high Cusárare waterfall. At km 44 (Basihuare), there are fine views of a mesa of pink and white rocks that overlooks the road. This is Cerro el Pastel (“Cake Mountain”) with its pinnacles. At km 56, near Umirá (or Humirá) are several spectacular incised meanders formed when the river’s course was preserved while the surrounding land was undergoing relatively rapid uplift. 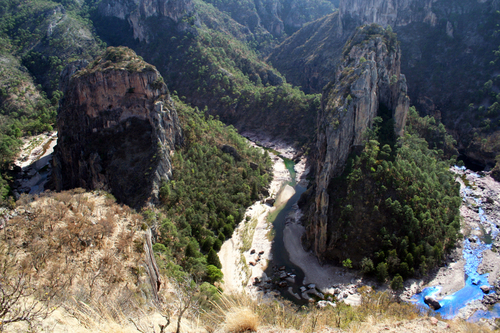 Small wonder that the Copper Canyon region is one of Mexico’s most important geomorphosites! McDowell, F.W. & Clabaugh, S.E. (1979) “Ignimbrites of the Sierra Madre Occidental and their relation to the tectonic history of western Mexico” in “Ash flow tuffs” edited by Chapin, C.E. & Elston, W.E., Geol. Soc. of America special paper # 180.